Xiaomi has just posted a new video of its foldable smartphone, whose price would be less than 1000 €. Very different from Samsung’s Galaxy Fold and Huawei’s Mate X, it is built around a screen that bends in two different places. A new promotional video of Xiaomi’s collapsible smartphone has just appeared on YouTube, report our colleagues at GSMArena . The sequence is part of the first video of the collapsible smartphone appeared in early January 2019 and with the video published by Lin Bin, president of Xiaomi . Xiaomi presents a foldable smartphone in 3: more attractive than the Galaxy Fold and the Mate X? The 10-second video, however, provides the most comprehensive overview of Xiaomi’s foldable smartphone. Unfolded, the device looks like a simple tablet. Note that the surface once unfolded is completely flat, which distinguishes it from its two high-end competitors. For now, there is no guessing fold marks on the screen, as is the case on the Galaxy Fold Samsung , or Huawei Mate X . We expect more images to decide on this point. To close the screen of the smartphone, simply fold down the outer parts of the slab to the rear. The two parts meet on the back of the device. Once it’s done, you get a standard size smartphone with a generous size screen at the front, enhanced by curved edges, and a screen split in half at the back. It is not known if these are usable once closed. Anyway, this design is rather attractive. Latest news, the Xiaomi foldable will be offered at a price of € 999 , half the size of the Galaxy Fold. The Chinese manufacturer intends to announce its creation at a conference scheduled between April and June 2019 . What do you think of this video ? 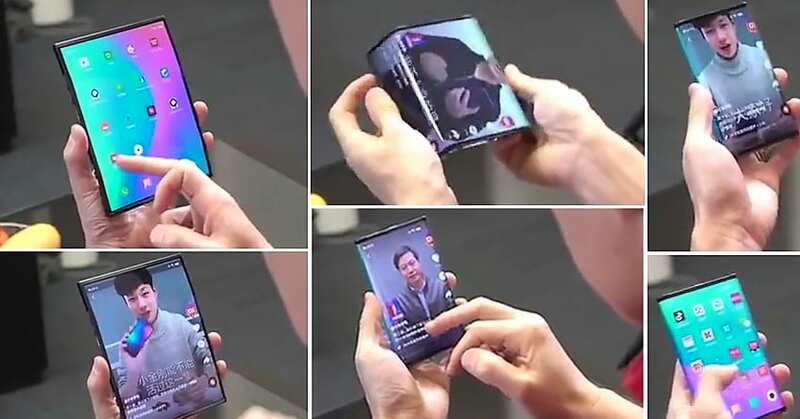 Does this foldable smartphone please you more than the proposals of the competition?